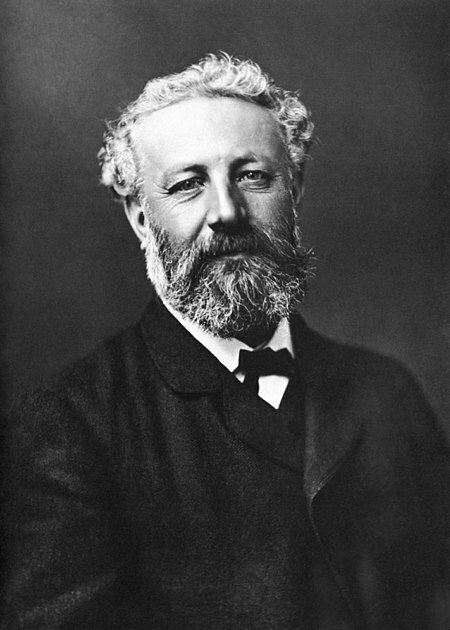 Today is the birthday (1828) of Jules Gabriel Verne, a French novelist, widely known for his collaboration with the publisher Pierre-Jules Hetzel leading to the creation of the Voyages extraordinaires, a popular series of adventure novels including Journey to the Center of the Earth (1864), Twenty Thousand Leagues Under the Sea (1870), and Around the World in Eighty Days (1873). 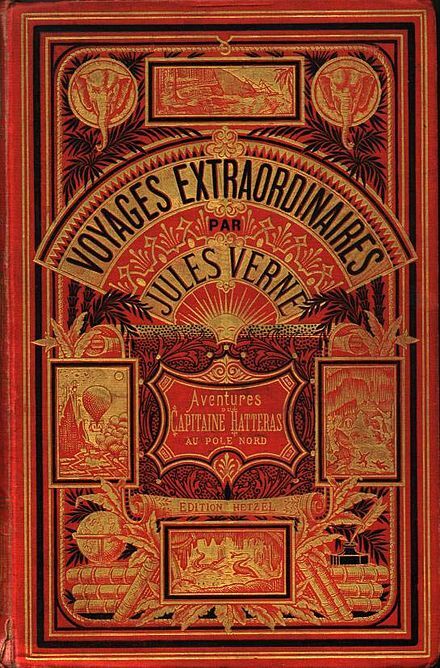 Between 1863 and 1905 Verne published 54 novels in the series. I first encountered Verne and Around the World in Eighty Days, as a small boy via the David Niven movie (1956). This was in the days before most people owned televisions, and my family used to go out to the cinema once a week to see whatever was playing that week. 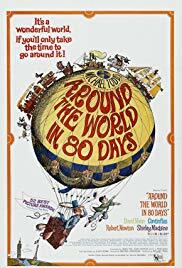 Around the World in Eighty Days, is one of the few I remember because it appealed to me, and I also remember being excited by the poster. I was not aware until much later – because at the time I was unaware of famous actors – just how star studded the cast was. The cast list looks like an inventory of actors from the 1940s and ‘50s. A few years later I read the book and was as captivated as by the movie, and so began reading all of Verne’s works I could get hold of. Around the World in Eighty Days is the only one that has held my attention over the years, partly because even as a boy I was a world traveler (I had been around the world by age 14), and I have never stopped. Mainly I liked it because of Verne’s characterization of Phileas Fogg. Fogg is certainly a caricature, but a kind one. Although Verne was thoroughly French, he certainly captured the Englishness of Fogg, and he also portrays him with a sense of deep admiration. When we first meet Fogg he is punctilious to a fault – always leaves home at exactly the same time, takes exactly the same number of steps to his club, dines at the same time, reads the same newspapers for the same amount of time, plays whist with the same partners, etc, etc. Yet . . . on a whim, it seems, he offers a wager of £20,000, half his net worth (and he is a very comfortably rich man), that he can travel around the world in 80 days, and takes the other £20,000 with him, expecting to use it for expenses on the journey. Not only that, he leaves that very night, convinced that he can achieve his goal, while no one else believes that he can. On his journey he faces unimaginable difficulties with aplomb, and, against all odds, returns precisely 80 days later. Fogg is adventurous, courageous, intelligent, unflappable, and honorable throughout the trip. Verne’s message is that to French eyes the English gentleman is stuffy, predictable and staid (that is, boring), but that phlegmatic exterior hides wonders. It is such a marvelous tale, and Verne is an excellent storyteller. Let is remember that in 1873, going around the world in eighty days did, indeed seem impossible, and we have to put ourselves back in that era to understand its impossibility. Nowadays we can fly around the world in well under eighty hours, and an orbiting craft could accomplish the same feat in eighty minutes. Let us also remember that reporter Nellie Bly copied Fogg and managed a circumnavigation in 72 days: http://www.bookofdaystales.com/around-the-world-in-72-days/ So, it could be done, and Fogg’s timetable was not very far off. Think about that when you jet halfway round the world effortlessly. His breakfast consisted of a side-dish, a broiled fish with Reading sauce, a scarlet slice of roast beef garnished with mushrooms, a rhubarb and gooseberry tart, and a morsel of Cheshire cheese, the whole being washed down with several cups of tea, for which the Reform is famous. I gave a recipe for Reading sauce here http://www.bookofdaystales.com/photography/ so let’s turn our attention to rhubarb and gooseberry tart. Top and tail the gooseberries and place them in a saucepan with the rhubarb, sugar, a small piece of lemon rind, and half a cup of water. Bring to a boil and simmer for about 10 minutes, or until soft. Drain the fruit, reserve the juice, and discard the lemon rind. Line a 9 inch pie plate with pastry. Add the drained fruit. You can simply cover with a top crust, or make a lattice top. 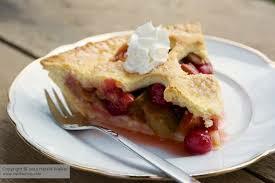 Brush the top with egg wash and sprinkle over a little caster sugar. If the crust is a whole sheet, cut some slits in it for steam to escape. Bake for 25 minutes, or until the crust is golden. Serve hot or cold with cream and the reserved juice.